Oh how I love this series. If the first book in the North Pole City Tales, Mending Noel, was candy canes and tinsel, this book was crème and velvet. Go ahead, read ‘Twas the Night Before Christmas' to the kids, then pick this up and treat yourself to romance - North Pole City style. For MM lovers this series is a Must Read holiday tradition. 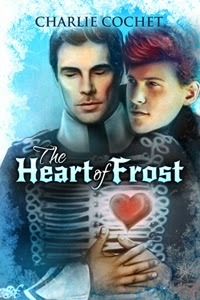 Jack Frost - Jack needs Rudy to keep him warm, but when someone threatens Rudy’s life how can Jack keep from freezing up? Rudy was only a Christmas elf, while Jack was the Spirit of Winter. Rudy Rein Dear - Rudy knows how special Jack is, but is Rudy special enough to keep Jack safe? And everyone else safe from Jack. Luckily for lovers of Mending Noel, Tim and Noel are here too and they are in perfect form. Ooooh, ooooh, oooh and just wait until you meet Vixen! How had a humble elf from the snowy plains of Gingerbread Grove ended up with the powerful Prince of Frost? on tearing their relationship apart. Rudy’s life is threatened by the Mouse King and after Rudy is injured Jack’s cool temper is tested. Rudy will stop at nothing to find a way to keep Jack from having a meltdown. Most of this book is set in present day North Pole City (lol), but we get to glimpse Jack and Rudy’s early relationship. We also get to see a sumptuous bath scene and lots of magic and action. Plus a gorgeous waltz at the Silver Bells Christmas Ball that will have you swooning. Charlie Cochet puts us smack dab in the middle of North Pole City. Her imagery creates a fantasyland of sumptuous delights filled with rich palaces and sparkling ballrooms. Then she surrounds all of this wonder in a love so full and deep that you can’t help but believe. If you’ve read Mending Noel you will see a distinct difference here. As I said earlier this is richer and not quite as sweet, but have no fear you will be swept away on fluffy snow drifts to a land of enchantment. I would like to thank Dreamspinner Press and Charlie Cochet for providing me with an advanced copy in exchange for my honest review.